This recipe came about because I had bought 10 very cheap chicken drumsticks, plus had promised I'd bring Rich some soup into the office once I had a flask to bring it in. It possibly wasn't the best soup to take to work in a flask, but it did go down well. I had simply roasted the Drumsticks in my new combination oven for 30 minutes or so, then stripped the best of the meat off them, and put the remains and bones into a large pan of water with some celery leaves, onion, carrot and bay leaves and simmered for a few hours to make a stock. Half the chicken I used a Pasta Bake, saving the other half for this soup. 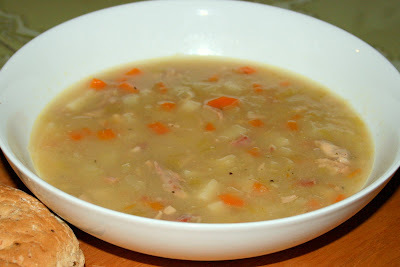 I pretty much did exactly what I did with my Leek and Potato Soup Recipe, only adding Celery and more Carrot than I would normally use, plus the Home-Made Stock, Chicken and Bacon. The Bacon was a bit of an afterthought as I discovered a few rashers which needed using up, but it definitely added nicely to the flavour. Melt a little butter in a pan and add the vegetables, keeping the heat low so that they soften without burning. After about 15-20 minutes add the Stock, Chicken, Bacon and Bay Leaves and bring to a simmer. Personally, I like quite a bit of Black Pepper, so I add quite a bit at this time so that it gets time to flavour the soup. Cover and let simmer for about 40 minutes. Taste the soup and season with more Salt and Pepper if necessary.